This is a very interesting question that you present. Can we really say that the pulps were dying in 1942? True ARGOSY ceased as a pulp around this period and became a sort of slick mens magazine. Many pulps decreased their page count and ceased publication because of the war time paper restrictions. But were they dying in 1942? I would put the date into the postwar period. After WW II I think it became obvious that the readership wasn't there in the high numbers anymore. Certainly by the early 1950's the pulps started to die off and by the end of 1955, just about all were dead except for a few like RANCH ROMANCES, TEXAS RANGERS, AND SCIENCE FICTION QUARTERLY. By then the digest era was in full bloom. RIP the pulps. I went back and did some unscientific research on the subject. I took a sample of 37 pulps across different genres - general/adventure, detective, western, love, science fiction, weird, spicy and hero and counted how many pulps were published each year from 1896 to 1972. As you can see, the pulps started declining around 1943 (so Walker was right, and I was off by a year), and went into a tailspin in the 1950s. Probably something you already knew, but the exact dates were new to me. If anyone's interested, the data's shared here as an Excel file. Thanks for this chart. According to these figures the pulps reached their peak in the late 1930's and then started to slowly decline because of the war time restrictions. I think the pulp publishers thought that things would improve after the war but they did not improve at all. In fact they got worse, so bad that the pulps were DOA by 1955. There are so many reasons why this happened. It just became impossible to produce a pulp magazine for 25 cents. By the early 1950's there were so many other things to entertain people. TV, paperbacks, more comicbook titles, and the new digest format. Digests could be produced alot cheaper and sold better than the pulps at 25 cents. When I look at my pulp collection, I wonder what would it cost to produce and sell such a magazine today? The few remaining digests sell for around $5.00 each. A 7 by 10 inch pulp would have to be priced at over $10 in today's market. Such a magazine, at such a price would simply not sell. In fact it would not even get distributed nowadays. In the Trenton, NJ area, except for Barnes & Noble, I cannot find a single newstand that carries the remaining 5 fiction digests. Soon, we might finally also see the end of the digest era. How much longer can ELLERY QUEEN MAGAZINE, ALFRED HITCHCOCK MAGAZINE, ASIMOV'S, ANALOG, and F&SF survive as hard copy magazines? Sorry, e-book lovers, but for a book and magazine collector, electronic books are a sorry substitute. This comment brings up some interesting points on radio versus television's impact on the pulps. How come radio in the 1920s and 1930s didn't have the same impact on the pulps that television had on them in the 1940s and 1950s? Were they aimed at different audiences? Was television really a factor in the decline of the pulps? Had the pulp audience moved on? My theory is that radio was strickly audio, while TV was audio AND video, so it had a bigger impact on the pulps. Many pulp fiction readers used to be addicted to reading short stories each month in the magazines. But with TV, many of them switched to watching the 30 or 60 minute series episodes each week. Watching TV is alot easier and requires less intellect than reading a book or story. Of course there are exceptions. Getting back to the impact of radio, I really don't think they had much of an impact at all on reading habits. For instance, I often read while listening to music on the radio or cd player. Another thing for us to think about, when the fiction magazines ruled the newstands in the 1920's and 1930's, there were very few distractions or competition for your entertainment dollar. The average family could go to the movies every now and then, listen to the radio, maybe go to a baseball game. So the monthly fiction magazines were great time killers. Nowadays, however, the fiction magazines are just about gone. Electronic gadgets now are the big time killer for many people. TV also of course. How many times have I noticed people playing with their cell phones, ipods, etc? I can't even sit down to eat with friends anymore, without someone texting or looking at their gadgets. Facebook is also a big killer of time. Walker, thanks for your comments. I'm learning a lot from this conversation. It's a subject that I find endlessly fascinating. For decades the newstands groaned under the weight of dozens of fiction magazines. Now when I look at the newstands I don't see any fiction magazines at all. The 5 remaining fiction digests get very poor distribution. Stories can be found in the literary quarterlies and that's about it, except for one in each issue of the NEW YORKER and a couple other slicks. When I first discovered the SF and crime digests in 1956, it was in a small neighborhood grocery store that I had been visiting for years. But I had never noticed the magazines at all. Then one day it was as if blinders had been lifted off my eyes and a whole new world of reading and collecting elevated me into a new dimension. Over 50 years later I'm still fascinated by the variety and quality of some of these magazines. ADVENTURE is probably my favorite and during the 1920's when Arthur Sullivant Hoffman was editor, it may have been the greatest fiction magazine of them all. I must have missed this post when you originally made it but saw your link this morning at pulpmags as well as your link to a similar chart that shows the total number of titles and issues printed from John Locke over at the PMP (http://www.pulpmags.org/contexts_pages/rise_&_fall_of_pulps.html). These are helpful in establishing when exactly pulps were most popular and when they died. I suspect that you would see concurrent trends across all magazines (not just fiction magazines) as far as a sharp drop off in titles published occurring from the early 40s through the late 50s. I agree with Martin that TV had a huge impact but also wonder if magazine readership had begun to wane even before TV. Thank you for your comments. Many times, it is the conversation around the articles where I learn more than the original article itself. 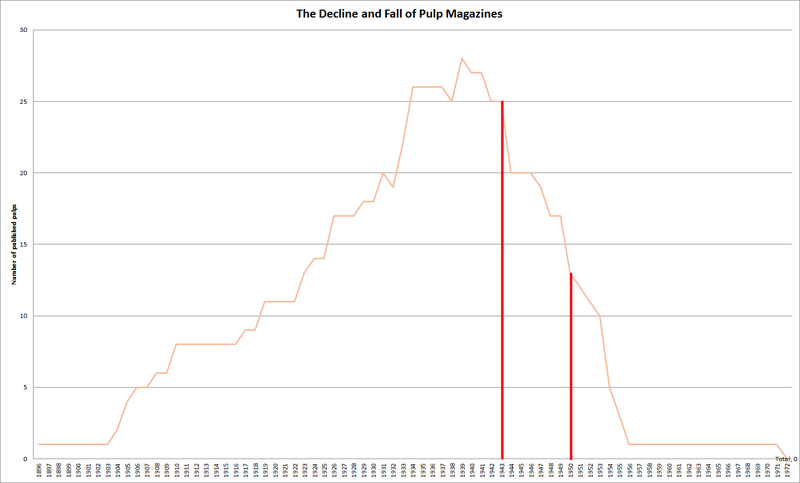 Re: charting the number of pulp titles/issues. b) they were willing and able to invest money for the same as opposed to milking the cash cows till they ran dry. If the overall profitability did not match that, I would be surprised. Thoughts?